Comfort room for one to two person, shower, WC, radio, Sat-TV, telephone, minibar, hair dryer, small safe, Wi-Fi for free. One of our double rooms has a water bed. 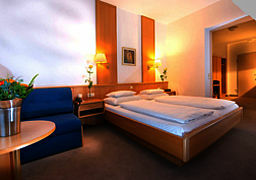 You have the choice between double room with kingsize bed and twin bed. Also you can choose room with view over Vienna or to our calm and green garden. Our studio apartments are perfect for two to four person and are equipped with bathroom, WC, radio, Sat-TV, telephone, small safe, hair dryer and free Wi-Fi. Bathrooms have bathtub. You also find a small kitchen with refrigerator and spacious area for sitting and eating. All studios are quite rooms located to our garden side. Our two family apartments are suitable for two to five person. Shower, WC, radio, Sat-TV, Wi-Fi, telephone and small safe. 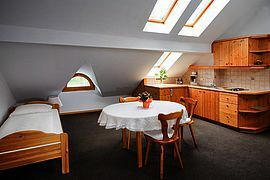 These rooms are very spacious and have seperated area for sleeping and living, a small kitchen and fridge. One of the two apartments has a fantastic view over Vienna. The other one has two rooms - one sleeping room and one living room. These rooms are especially appropriate for families and/ or longer stays.